LANSING — Michigan lawmakers are considering moving 17-year-olds from the adult to juvenile court system. Supporters say the change is needed to protect juvenile offenders from violence and reduce the likelihood that they will reoffend. Michigan is one of only four states that treats 17-year-old offenders as adults. The largest roadblock facing the 19-bill package is the projected additional cost to county governments and the juvenile court system. Other groups opposing the move are the Michigan Probate Judges Association, Prosecuting Attorneys Association of Michigan and the Michigan Association for Family Court Administration. The Raise the Age legislative package would cost the state and county governments a combined $27 million to $61 million annually, according to the Legislative Council Criminal Justice Policy Commission. Groups that oppose the bills support the concept of bringing 17-year-olds into the juvenile courts, but can’t support them until adequate funding is presented, Keit said. County governments would be hit hardest, as they initially assess a child when they come into the juvenile court system. A judge determines the treatment needs and then the county provides that service. The county sends the cost of the service to the state and is reimbursed for half, Keit said. There are 21 county or court-operated juvenile detention facilities across the state. Some local police officials agree that the change is needed to accommodate offenders who are not mature adults. Federal law defines adulthood as 18 years old. But in Michigan, a 17-year-old is considered an adult in the eyes of the court. The Council on Crime and Delinquency is the leading the campaign with a “raise the age” slogan. “We’re hoping that this legislation can be an opportunity for Michigan and its counties and juvenile courts to take the opportunity to look at where they can reform this system in other ways, just like every other state has when they’ve passed this kind of legislation,” Smith said. 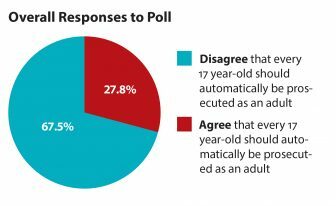 A recent statewide poll by the Michigan Catholic Conference found that more than two-thirds of 600 likely voters said that a 17-year-old should not be automatically prosecuted as an adult. “We support a two-year implementation date to give counties time to assess and the courts time to assess what their needs are and where the capacity gaps are for staff and facilities,” Smith said. A similar package passed the House but stalled in the Senate in the last legislative session. The package got a recent hearing in the House Law and Justice Committee. Supporters say they hope that the committee will put the bills to a vote after the fall election, Smith said. “Compared to previous years, all the parties involved — the county stakeholders, state government, the governor’s office, Department of Health and Human Services — have been much more collaborative and really solution-focused in trying to figure out how to overcome some of the barriers we face, which aren’t much different than other states,” Smith said. County veteran services are poised to get an additional $2 million this year that could lead to more counties opening offices and counties with offices expanding their services. The new County Veteran Service Fund will give at least $25,000 to each county that fund veteran service programs or open new offices and that apply. But some counties have suggested that the paperwork is too demanding.